Using portobello mushroom caps as a base for tomato sauce, chopped vegetables and melted mozzarella cheese makes a delightful and fun finger-food. They're equally delicious for a low-carb, vegetarian dinner or savory appetizer for a cocktail party. Roasting the mushrooms in a mixture of olive oil and Italian herbs results in super flavorful, tender mushroom caps just waiting to be filled with chopped bell peppers, onions and salty black olives. The whole dish takes just 25 minutes to complete, perfect for easy dinners or spontaneous gatherings. Get your kids engaged in the cooking process by allowing them to make their own ‘pizza’ with their favorite toppings. Children are often more willing to try new things when they’ve had a hand in preparing the meal! Add kid-friendly toppings like chopped pepperoni and cooked Italian sausage if you like. Per Serving: 117 calories; 6g fat; 10.1g carbohydrates; 9g protein; 15mg cholesterol; 296mg sodium. This gluten-free alternative is amazing! You can make these for a party of for yourself coming home after a long day of work. These cheesy delights are enjoyed best by itself. I made these with onions, cooked chicken, and olives as my toppings. They turned out great. Definitely would make these as a dinner party appetizer. I think next time I'll mix in blue cheese with the mozzarella for a sharper flavor overall. That said, be careful when they come out of the oven, I almost burned my tongue on the pizza sauce! I threw some sausage in there and they were hit at last game night. Fun way to get more veggies in your meal and it just tastes great. 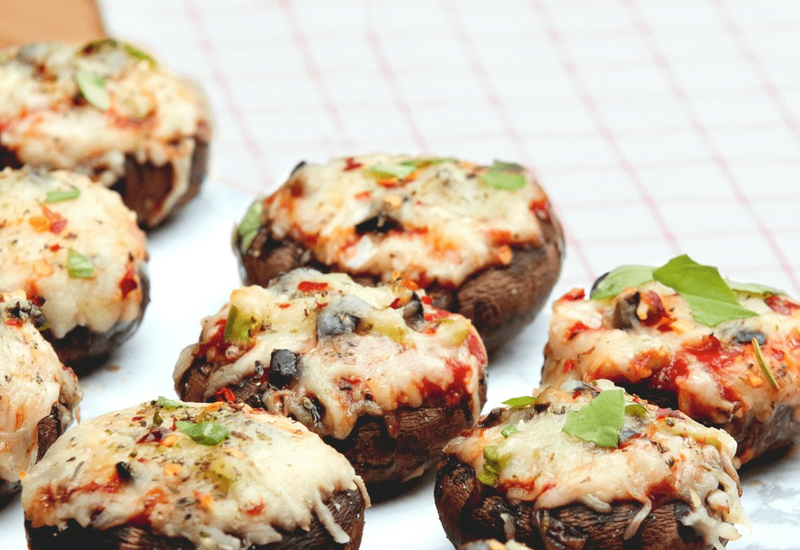 These little pizza-stuffed mushrooms was such a great treat, I couldn't stop eating them. I would totally add some meat to bring up to the next level. Overall a great and simple recipe that packs a punch. Made this for our kickoff party this week and invited my son's football team over and they mowed through them. Husband says it needs some sausage but I think the veggie version is awesome. Its so easy to modify that you could really put any of your favorite toppings on!